Along with daily brushing and flossing, limiting your child’s sugar consumption is an important way to prevent tooth decay. We all know the usual suspects: candy, sugar-added snacks and sodas. But there’s one category you may not at first think fits the profile—juices. 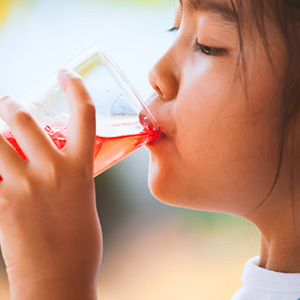 But even natural juices with no added sugar can raise your child’s risk of tooth decay if they’re drinking too much. Tooth decay is caused by certain strains of bacteria in the mouth, which produce acid. Sugar in any form (sucrose, fructose, maltose, etc.) is a primary food source for these bacteria. When there’s a ready food source, bacteria consume it and produce abnormally high levels of acid. This can cause the mineral content of tooth enamel to dissolve faster than saliva, which neutralizes acid, can reverse the tide. Juices without added sugar still contain the natural sugar of the fruit from which they originate. The American Academy of Pediatrics conducted a study of the effect of these natural juice sugars on dental health. Their conclusion: it can have an effect, so the amount of juice consumed daily by a child should be restricted according to age. Ages 7-18: no more than 8 ounces (1 cup) a day. Again, these are guidelines—you should also discuss the right limits for your individual child with your dentist or pediatrician. And if you’re wondering what kind of beverages pose less risk of tooth decay, you can look to low or non-fat milk. And, of course, don’t forget water—besides containing no sugar, nature’s hydrator has a neutral pH, so it won’t increase acidity in the mouth. Tooth decay is one of the biggest health problems many kids face. But with good teeth-friendly habits, including restricting sugar intake in any of its many forms (including juices) you can go a long way in reducing their risk of this destructive disease. If you would like more information on best dental care practices for children, please contact us or schedule an appointment for a consultation.